Tonight it was De Traffords turn to host the Valley Wine Club. David Trafford and Xenia were the hosts for the evening. David Trafford is a Cape Winemaker Guild member, he is the winemaker and owner of this wine estate. Xenia is the admin, accounts and logistics person and helps out in the tasting room also. 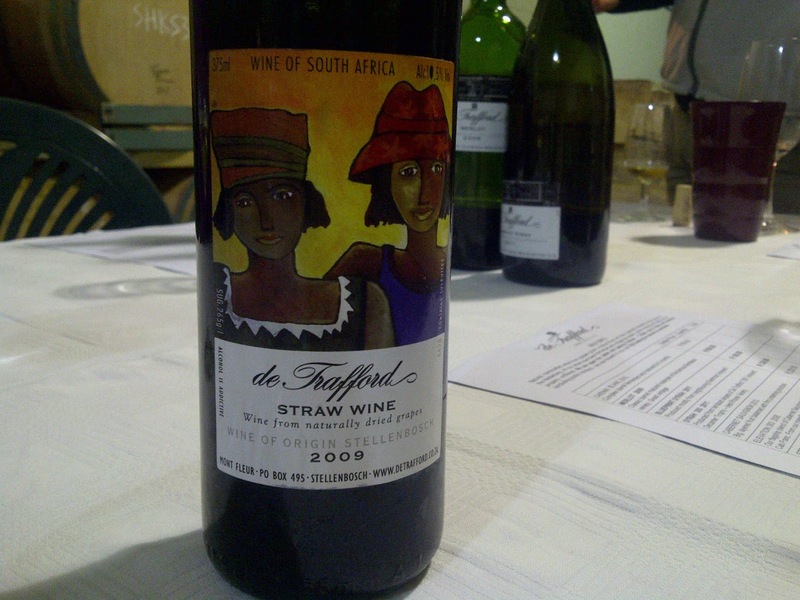 De Trafford is quite a small wine estate in that they produce around 3500 cases a year. They also have a wine estate in Malgas which they produce another 2500 cases of the Sijnn wine from. We had the tasting in the cellar as their tasting room was not big enough for all of us who attended this tasting. As De Trafford is only open for tastings Friday and Saturday from 10am - 1pm and is right at the end of Blaauwklippen Road most of us had never had the chance to visit the estate.This was therefore an ideal opportunity to come and check out their estate and try their wine. Xenia was the perfect host. She was very welcoming and made everyone feel at home. She has a great understanding of the history of De Trafford and Sijnn wines so started the evening off by introducing us to their estate. David was very humble especially when it came to his wine. He was very laid back and friendly; making everyone feel at home. 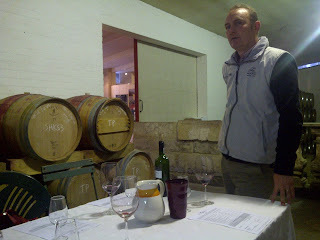 As they don't have a tasting room manager or assistant, David hosted the evening, which was great as he was able to give us a very informative and slightly more technical tasting to what we usually have. 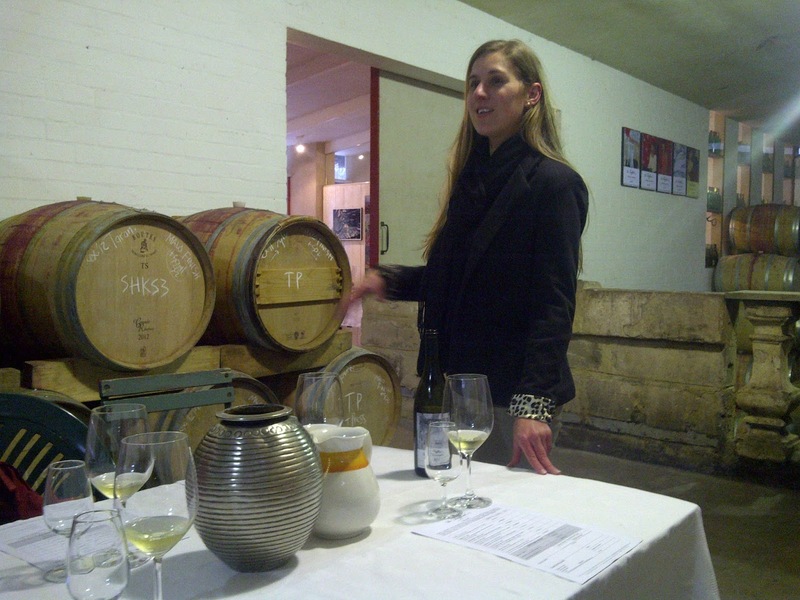 We started off tasting the Chenin Blanc 2012 at R180 a bottle. It had a floral/honey nose with hints of vanilla. It was fresh with slight acidity, very smooth, and it tasted amazing after it had had some time to breath!! We were informed that their 1st vintage was in 1995, they used grapes for the 2012 from their older and younger vines, 15% was matured in new oak and no malolactic fermentation was done. They produce 800-900 cases a year of this wine. It was basket pressed. Merlot 2009 is R180 a bottle. It had a beautiful nose of berries, tobacco and oak, there was a slight smokiness to the wine, it was a little dry, had slight acidity, was smooth, yet had quite a sharp finish. It is a heavy and rather serious wine. It spent 19 months in barrels, 35% was new oak. Blueprint Syrah 2011 is R160 a bottle. No new oak was used on this wine, perhaps this is why it comes across as a more approachable wine. I got a bit of blueberry and bubblegum on the nose as well as nice pungent fruity - especially berry - aromas. The flavour was delicious. It had a slightly spicy aftertaste, was soft, medium bodied and a great wine!! It is still a little serious with a dry finish. This was however one of my favourite wines on the night!! Syrah 393 2011 is R330 a bottle. It has a dark colour. This was also a big serious wine with slightly dry finish. It was smooth on the palate. I got dried apricot on the nose, it was delicious, I loved it. Cabernet Sauvignon 2010 is R230 a bottle. This had a nice fruity nose, was smooth on the palate with a dry, sharp finish. Tones of plum and dark berry flavours. Another serious red. Pleasant but serious. Elevation 393 2008 is their flagship wine. It has yummy cherry tobacco on the nose. The aroma was lovely!! This wine was so smooth!! Beautifully balanced. Lovely fruitiness. Lovely finish. A great wine!!! 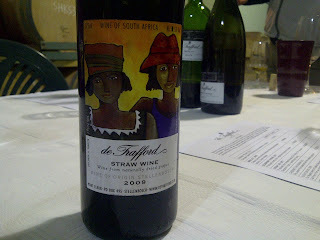 Straw Wine 2009 is R200 a bottle. It had a gorgeous nose of peach and apricot and sweetness to it. It was very smooth, full bodied, round mouth feel. It was delicious, wow, loved it!!! This is definitely one of the best dessert wines I have ever tasted!! I highly recommend everyone gets themself a bottle of this to try at some stage!! We also got to try some of the Sijnn wines on the night which included the Sijnn Low Profile which is mostly Touriga Nacional, Sijnn Touriga Nacional, and the Sijnn Red Blend. These wines were also very nice. I can't wait to try them all when the wine estate opens next year in Malgas!! Overall a fantastic wine tasting experience. Due to this wine estates location it has a unique charm to it, you feel like you have stumbled over a place that no one else knows about and then you get to experience truly great quality wine!! I highly recommend visiting this estate while in Stellenbosch. Just remember they are only open between 10am - 1pm Fridays and Saturday! !